During the Bronze Age, the inhabitants of Cyprus (or Alashiya, as it was known then) spoke Eteocypriot, a language similar to Linear A found in Minoan Crete, this suggests that there was a lot of interaction between the two islands. 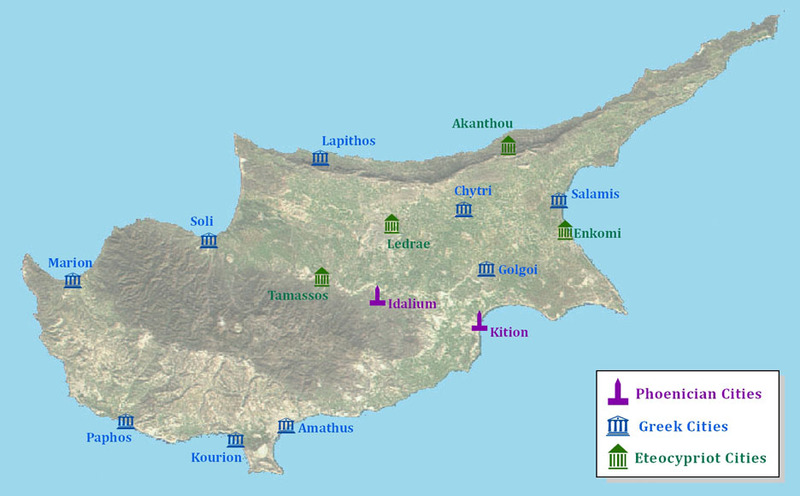 Starting at the end of the Bronze Age, Greeks began settling on the island, many of them Arcadians from the Peloponnese, who brought the Arcadocypriot language to the island. For a time both the Eteocypriot and Arcadocypriot dialects were spoken together on the island. This fact is attested to by numerous inscriptions written in both languages. By the 4th Century BC, Eteocypriot dialect had died out. The Phoenicians also began arriving in Cyprus towards the end of the Bronze Age, they built their largest city at Kition and then began spreading their influence inland at sites such as Idalium. The Cypriot King Pasikypros of Tamassos is said to have sold his entire kingdom to the Phoenicians of Kition for a price of 50 talents.